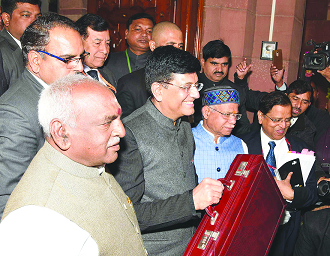 Interim Budget 2019-20 was presented in Parliament on 1 Feb, 2019 by the Union Minister for Finance, Corporate Affairs, Railways & Coal, Shri Piyush Goyal. Besides having a major Scheme for the farmers, it provides tax sops and sets the Developmental Agenda for the years to come. Under this Government of India funded Scheme, Rs.2,000 each will be transferred to the bank accounts of around 12 crore Small and Marginal farmer families, in three equal installments. This programme would be made effective from 1st December 2018 and the first installment for the period upto 31st March 2019 would be paid during this year itself. To provide pensionary benefits to at least 10 crore labourers and workers in the unorganised sector a new Scheme called 'Pradhan Mantri Shram-Yogi Maandhan' is announced. Within next five years it would be one of the largest pension schemes of the world. A sum of Rs.500 crore has been allocated for the Scheme. Additional funds will be provided as needed. The scheme will also be implemented from the current year, he said. The Government wants the GST burden on home buyers to be reduced and accordingly the GST Council was moved to appoint a Group of Ministers to examine and make recommendations in this regard at the earliest. Soon, businesses comprising over 90% of GST payers will be allowed to file quarterly return. The Finance Minister stated that a stage for high growth in decades to come, has now been set, after a wave of next generation path breaking structural reforms over the last five years, including introduction of Goods and Services Tax (GST) and other taxation reforms. Due to such a stable and predictable regulatory regime, growing economy and strong fundamentals, India could attract massive amount of as much as $239 billion of Foreign Direct Investment (FDI) during the last 5 years, when most of the FDI was allowed to come in through the automatic route. Pradhan Mantri Gram Sadak Yojana (PMGSY) is being allocated Rs.19,000 crore in BE 2019-20 as against Rs.15,500 crore in RE 2018-19. During the period 2014-18, a total number of 1.53 crore houses have been built under the Pradhan Mantri Awas Yojana. World’s largest healthcare programme, Ayushman Bharat, to provide medical treatment to nearly 50 crore people in the country, around 10 lakh patients have already benefited through free treatment for medical treatment which would have otherwise cost them Rs. 3,000 crore. Lakhs of poor and middle class people are also benefiting from reduction in the prices of essential medicines, cardiac stents and knee implants, and availability of medicines at affordable prices through Pradhan Mantri Jan Aushadhi Kendras, the Finance Minister added. 14 of the 21 AIIMS operating or being established in the country presently have been announced since 2014. He also announced setting up of a new - the 22nd AIIMS in Haryana. Under the Ujjwala Yojana aiming delivery of 8 crore free LPG connections, more than 6 crore connections have already been given and the remaining will get free gas connections by next year. A National Artificial Intelligence Portal will also be developed soon as a part of the National Programme on 'Artificial Intelligence'. The Government e-Marketplace (GeM), created by the present Government two years ago, resulted in average savings of 25-28% and the platform will now be extended to all CPSEs. Transactions of over Rs. 17,500 crore have taken place so far. Domestic air traffic passengers have doubled during the last five years, leading to large number of jobs also being created. The number of operational airports has crossed 100 with the commissioning of the Pakyong airport in Sikkim. Arunachal Pradesh came on the air map recently and Meghalaya, Tripura and Mizoram have come on India’s rail map for the first time. The Finance Minister said that he is proposing, through the Finance Bill, necessary amendments to levy Stamp duties on one instrument relating to one transaction and get collected at one place through the Stock Exchanges. The duty so collected will be shared with the State Governments seamlessly on the basis of domicile of buying client, he said. After completion of the fiscal deficit consolidation programme, the Government would now focus on Debt consolidation. He said “We have maintained the glide path towards our target of 3% of fiscal deficit to be achieved by 2020-21. India’s Debt to GDP ratio was 46.5% in year 2017-18. The FRBM Act prescribes that the Debt to GDP ratio of the Government of India should be brought down to 40% by 2024-25. “Along with completion of the fiscal deficit consolidation programme, we will now focus on Debt consolidation”.